Houseboat Insider - You want & need Spring to start Quickly! You want & need Spring to start Quickly! Welcome, and a hearty welcome to our new readers. Again, this month has been another busy one for subscriptions and articles. I imagine that "spring" is on everyone's mind, and am being told it's coming, I promise! Hope you enjoy this edition as much as I had putting it together. Three new major additions this month! for Houseboat Parts & Accessories. NEW: You can now read about all those items, parts and accessories that are involved in houseboating. The Reviews looks at the Pros & Cons of all those popular items, and the Buyer's Guide helps in making educated decisions. With 30+ years of boating experience, it's a Win-Win situation. go to Reviews and Buyer's Guide for Houseboat Parts & Accessories. Share & Contribute your Experiences. NEW: What's on Sale section is where you'll find current deals, discounts, and savings on houseboat products and services. You'll find things like new products, promotions, discounts, free shipping, and anything that can stretch your houseboating budget. A win-win situation for everyone. Another very busy month, plenty of great articles to choose from. 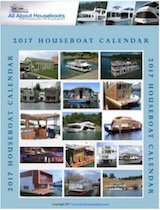 List of Houseboat Sales and Specials with Deals and Discounts to save Money on items for House Boats. Basically a Pontoon Houseboat Log Cabin on the water. After a years worth of weekends, lots of aluminum and sweat later... the Nuthouse was born. Homebuilt Houseboat Designs with Ideas, and free House Boat Plans to help start Building your Homemade House Boats. Is it a slow boat or a house boat? When our kids were young someone reminded me of the old saying, the family that plays together, stays together. List of Houseboat Designs showing the Engines, Construction, Interior, Exterior, and the Basics. Used Houseboats For Sale free guide will Help You become a wise House Boat Buyer for your next Houseboat Purchase. It's been a very very busy month, and I just had to share it with you all! Was the Houseboat Show a big hit for you? to the show in 2007, and it was a BLAST. Where else can you get to visit houseboats ranging from 30 feet to over 100 feet, all of this in one place, and in one afternoon? It's on March 14-16, 2008, in Louisville, KY.